04/24/15 – Update v4.5 Teams have been added! Sale on the Bundle Stars Store! A new feature that has been a long time in coming is Teams! You can now choose one of four teams and communicate privately to only your teammates! This will make games that require teams much easier and more fun all around! Since our last update we’re happy to hear that most connection issues seem to be resolved. If you run into any issues connecting or hosting, be sure to enable the Proxy Server closest to your area to ensure you can connect or your friends can connect. Please post on our Tech Support Forum if you continue to have problems. Tabletop Simulator is also on sale at the Bundle Stars Store for 30% off for both the individual and 4-pack as part of their Simulator Weekend. If you wanted to pick up more copies or have friends and family who wanted the game, please spread the word around! The sale ends on Sunday, April 26th. 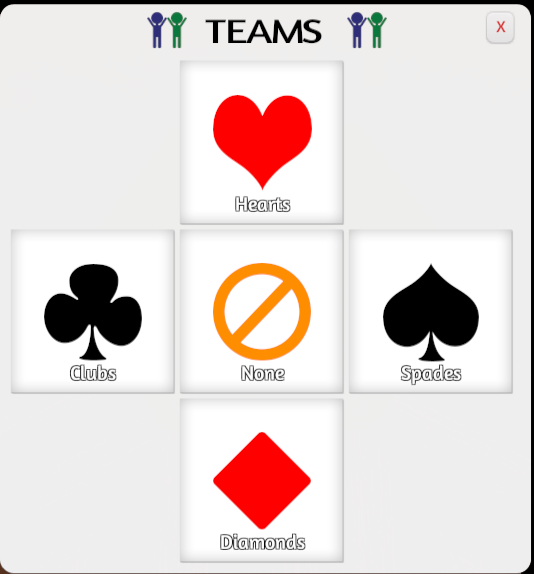 Teams have been added to the game: Hearts, Diamonds, Clubs, and Spades. Being on the same team means you can see into each others hiddens areas or hands. You can also text communicate just with your team using the ‘\’ key (above enter). Host can also force a player to join a team by clicking on them and selecting change team. Host Options menu has been redone to match latest UI with tabs. 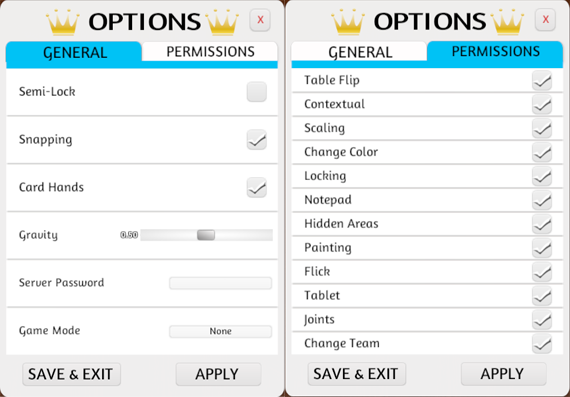 General options and player permissions have been separated into two tabs for easier browsing. 2 new player permissions added: Joints and Change Team. Mousing over each option will now provide a short summary. Improved error handling of failing to connect to the proxy when hosting. Direct connect input field will now trim whitespace, fixing potential copy & paste problems. Fixed some potential connections issues. Fixed failing to connect to proxy server when hosting from breaking the game requiring a restart. Fixed other players pointers spawning as a white pointer and fixing only after interacting with something. Fixed potential problem when kicking someone connected to you through the proxy. Fixed card searching grabbing nearby locked cards into the wheel. Fixed Semi-Lock setting not applying properly for promoted players.